The world's first IEEE 802.11b wireless development kit for the PICmicro! Iosoft Ltd. brings standard wireless networking to microcontrollers, in a ground-breaking addition to their TCP/IP connectivity package. The ChipWeb Wireless development kit gives a low-cost entry into radio networking, yet has full compatibility with IEEE 802.11b (WiFi) networks. The kit has both hardware and software components for rapid standards-based wireless development. The Iosoft ER2x series of development boards provide a ready-made hardware platform for experimenting with wireless, Ethernet and serial connectivity. 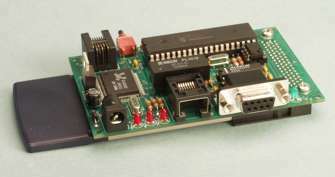 The ER25 WLAN interface may be powered down by the microcontroller, producing a major power saving if communications are infrequent. A source-code package is available. A PDF version of the ER21 hardware manual is available; click here to download it (approx 300 kB). 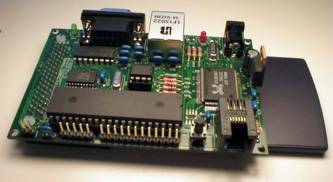 This version does not include the circuit diagram, which is only supplied with the board. The software documentation PDF is included in the source-code zipfile. There is a FAQ (Frequently Asked Question) list with useful hints & tips on Iosoft wireless products; click here to view it. 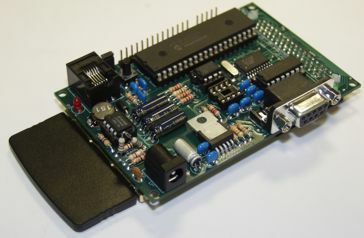 The ER21 or ER25 development boards are priced at GBP 165 (approx 260 US dollars or 240 Euro), and the ER22 is GBP 180. The source-code package must be purchased separately, either online from the Iosoft e-commerce site (GBP 45) or on CD-ROM from our hardware distributor. Click here for version information. The ER21/ER22/ER25 hardware is usually available ex-stock from our manufacturing partner Crownhill Associates www.crownhill.co.uk Tel. +44(0)1353 749990, Fax +44(0)1353 749991, credit-card orders accepted. It is not available direct from Iosoft Ltd. If the development kit is used for personal experimentation, no additional license is required. Incorporation in a commercial product must be covered by a commercial license; a single payment allows an organisation to incorporate unlimited copies of the object code in their products. Source code may not be redistributed. Existing ChipWeb TCP/IP licensees may upgrade to add wireless capability; see the license page for more information.